UPDATES AT END OF POST: Picture has been changed! 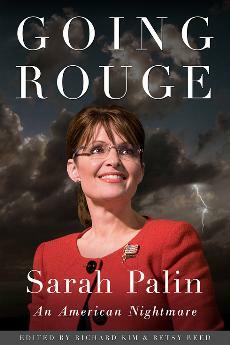 USA Today's Oval blog Monday used a picture of a Sarah Palin-hating book called "Going Rouge, An American Nightmare" instead of the former Alaska Governor's "Going Rogue." In her much-discussed new book, former Republican vice presidential candidate Sarah Palin praises Hillary Rodham Clinton for her 2008 presidential campaign. An alternative, liberal judgment of Sarah Palin's legacy will appear in book stores on November 17, the same day Palin's own autobiography, "Going Rogue: An American Life," hits the shelves. "Going Rouge: An American Nightmare" is the brainchild of Richard Kim and Betsy Reed, editors at the progressive magazine The Nation. 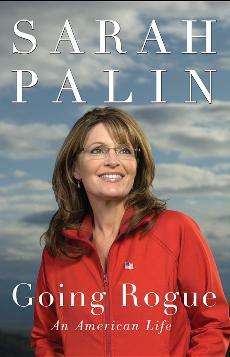 In addition to their nearly identical titles, the two books share similar covers, both showing Palin smiling into the distance. Maybe the good folks at USA Today should explain why the picture of a liberal book attacking Palin was used instead of the real one. For the record, the picture was still "Going Rouge" shortly before I posted this piece at 10:09 AM. Maybe someone at USA Today should add an update to the article explaining why "Going Rouge" was there for at least 21 hours. ERRATUM: An earlier posting featured the photo of a different Sarah Palin book. The Oval regrets the error.